The included photos of Willy Rajter (Ciechanow) and Arthur Wajsman were used to complete the "Give them a Face" portrait collection (KD_00017) and the commemoration wall at the Kazerne Dossin museum. Gitla Rajter was born on 30 October 1904 in Nowy Korczyn, Poland, as the daughter of Wolf Rajter (born in 1867 in Nowy Korczyn, Poland) and Chaja Klarman or Clarman (born in 1865 in Stopnica, Poland). Gitla left Poland in August 1927. At least two of her sisters would follow her to Belgium. In Antwerp, Gitla found a job as a shop keeper in a textile store located at Londenstraat 1 and she religiously married the British Jewish owner John Marks (born on 1st August 1874 in Lodz, Poland). The couple would have three children: Eva Rajter (born on 9 July 1928 in Antwerp), Edith Rajter (born on 28 May 1935 in Antwerp) and Willy Rajter (born on 20 July 1942 in Antwerp). During the war John Marks, being British, was arrested and detained in a camp for British nationals, first in Leopoldsburg, Belgium, later in Kreuzburg, Germany. John would later be sent to Portugal. There he was traded against German soldiers. John was subsequently sent to London where he survived the war. Since they were only religiously and not legally married Gitla had not obtained John’s British nationality. Therefore, Gitla continued to attempt to obtain it in order to protect her and her children from deportation. As Gitla was also involved in resistance activities including hiding resistance fighters and distributing clandestine press, she thus sought additional protection for her family. Gitla and her children Eva, Edith and Willy were arrested a first time on 29 January 1943. That day collaborators of the Sicherheitspolizei-Sicherheitsdienst, including the infamous Felix Lauterborn, ransacked the family home at Londenstraat and mistreated both Gitla and the children. Baby Willy was thrown down the stairs, luckily without obtaining any injuries, and all valuables were stolen. The four family members were arrested and interned at the Dossin barracks in Mechelen for several weeks. The Rajters were only released after an intervention by the Association of Jews in Belgium which took place on 18 March 1943 and which was based on John Marks’s British nationality. Gitla and her children were arrested a second time on 15 May 1944 and were detained at the Antwerp prison in Begijnenstraat. From there Gitla and Eva were transferred to the Dossin barracks on 18 May 1944 and then deported via Transport XXV to Auschwitz-Birkenau. Both Gitla and Eva survived Auschwitz and the death marches to Bergen-Belsen, where they were liberated by the British army on 15 April 1945. 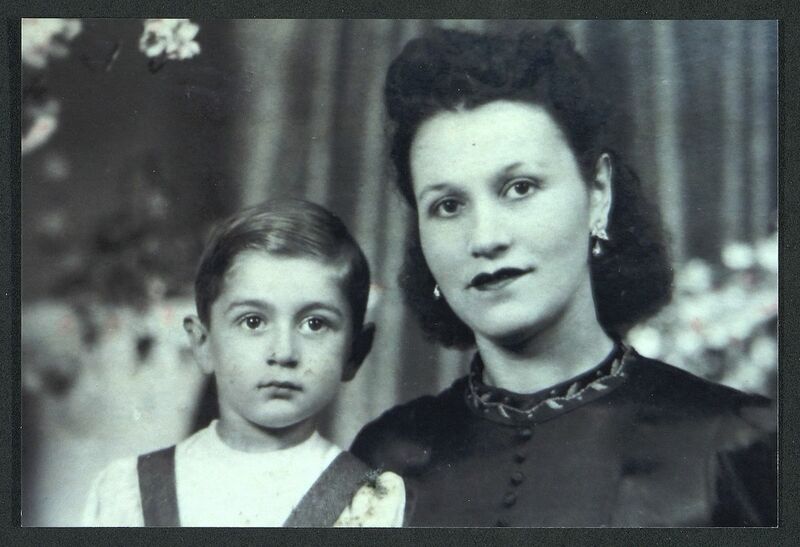 Eva was repatriated to Belgium on 25 May 1945, Gitla not before 17 June 1945 since she was a Polish national and she had to prove that she had lived in Antwerp before having been deportated. In Antwerp Gitla and Eva were reunited with Edith and Willy. After the deportation of their mother and sister, the youngest children had been housed in orphanages led by the Association of Jews in Belgium. Willyfor example had been sent to the Jewish home located at Rue Baron de Castro in Etterbeek, created in 1943, where only toddlers were housed. In 1945 the Rajter family returned to Londenstraat 1. Gitla Rajter passed away in 1999. Gitla had at least two sisters who migrated to Belgium before the war. Older sister Ruchla Rajter was born on 30 October 1900 in Nowy Korczyn, Poland, and had arrived in Belgium a year after Gitla, in June 1928. By 1930 Ruchla had married the Polish miner Hersz Wajsman (born on 11 August 1900 in Warsaw, Poland). The couple would have one son, Arthur Wajsman, who was born on 25 July 1929 in Charleroi, Belgium. The family lived in the small town Gilly nearby. On 31 July 1942, Hersz Wajsman was arrested and deported to France to become a forced labourer for Organiation Todt. He did not survive deportation via Transport XVI to Auschwitz-Birkenau on 31 October 1942. Ruchla on her own continued their resistance activities, as the family stored ammunition for the Armed Partisans. In 1943, Ruchla’s son Arthur, who was only 13 years old, was also arrested. He was killed after deportation from the Dossin barracks to Auschwitz-Birkenau via Transport XXI on 31 July 1943. Ruchla thus became the only survivor of her family, dying her hair black and wearing a big catholic cross around her neck at all times to avoid any accusations of being Jewish. In 1947 Ruchla remarried the British Jewish truck driver Isaac Michel Gorski who was living in Palestine at the time. In 1954, Ruchla Rajter obtained Belgian citizenship. Ruchla passed away in 1980. Ruchla Rajter had been very ill in 1930, leading to the migration of youngest sister Estera Rajter (born on 25 January 1909 in Nowy Korczyn, Poland) who arrived in Belgium in May 1930 to take care of Ruchla and her family. Estera Rajter was born on 25 January 1909 in Nowy Korczyn, Poland, and had become a tailor. When in July 1931 Ruchla’s health improved, Estera went to live with her other sister Gitla at Londenstraat 1 in Antwerp. Estera then married Abram Ciechanow (born on 29 January 1911 in Plonsk, Poland), a tailor who had emigrated from Poland to Belgium in March 1931, and gave birth to their son Willy Ciechanow on 5 June 1939. In January 1943, Estera, her husband Abram, their son Arthur, and Abram’s sister Rachel Ciechanow (married Lublin) were arrested. None of them survived deportation from the Dossin barracks to Auschwitz-Birkenau via Transport XIX on 15 January 1943. Willy Rajter (Marks) entrusted copies of a selection of family photos to Kazerne Dossin in 2018.